Copyright 2012 The Authors - The University is continuing to endeavour to trace the copyright owner(s) and in the meantime this item has been reproduced here in good faith. We would be pleased to hear from the copyright owner(s). 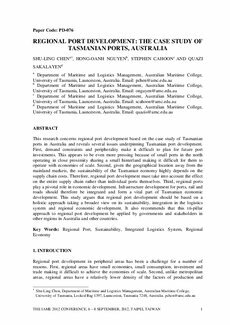 This research concerns regional port development based on the case study of Tasmanian ports in Australia and reveals several issues underpinning Tasmanian port development. First, demand constraints and peripherality make it difficult to plan for future port investments. This appears to be even more pressing because of small ports in the north operating in close proximity sharing a small hinterland making it difficult for them to operate with economies of scale. Second, given the geographical location away from the mainland markets, the sustainability of the Tasmanian economy highly depends on the supply chain costs. Therefore, regional port development must take into account the effect on the entire supply chain rather than individual ports themselves. Third, regional ports play a pivotal role in economic development. Infrastructure development for ports, rail and roads should therefore be integrated and form a vital part of Tasmanian economic development. This study argues that regional port development should be based on a holistic approach taking a broader view on its sustainability, integration in the logistics system and regional economic development. It also recommends that this tri-pillar approach to regional port development be applied by governments and stakeholders in other regions in Australia and other countries.